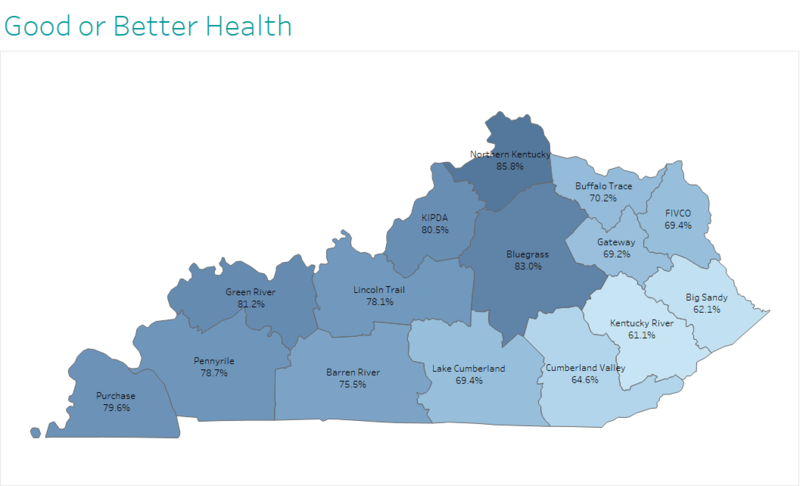 Northern, central and western Kentucky counties reported higher rates of good or better health than their eastern counterparts. The KY Cabinet for Health and Family Services has released its 2016 Kentucky Area Development District (ADD) Profiles report, and Kentucky still struggles with diabetes, obesity, self-reported good health and physical activity compared to the rest of the nation. However, Kentucky’s healthcare coverage rate continued to rise, from 90% to 93%, above the national state median rate of 89%. The report, comprised of data from Kentucky’s Behavioral Risk Factor Surveillance System (BRFSS), contains self-reported data from Kentucky residents throughout the state. Weight and diabetes continues to be a challenge for Kentucky. After a significant jump in diabetes rate in the 2014 survey, from 10.6% to 12.5%, with the rate of adults who report a diagnosis of diabetes rose slightly to 13.4% in the 2015 survey. Meanwhile, the national median rate of 10.0% remained relatively unchanged. The KIPDA ADD, while below the state rate with 12.4% reporting a diabetes diagnosis, also saw a slight increase. For Kentucky, the rate of adults who are overweight (BMI = 25.0 – 29.9) decreased, while the rate of adults who are obese (BMI > 29.9) increased. The overall proportion of Kentuckians who self-reported as overweight or obese remained relatively the same. All counties in Kentucky reported higher-than-national-median rates of high blood pressure diagnoses. Other measures, such as proportion of respondents who participate in any physical activity, adults who have ever had a heart attack and adults with high blood cholesterol remain worse than the national state median. Those struggles are reflected in overall health outcomes like self-reported overall health, limitations on activity and high blood pressure. Although Kentucky’s rate of residents who report good or better health improved slightly in 2015 to 78%, up from 76% in 2014, it still lags behind the national state median of 84%. More than a quarter (27%) of Kentuckians report limited activity due to physical, mental or emotional problems, higher than the 201% national state median. And the proportion of Kentuckians who report high blood pressure, 39%, is higher than the national rate of 31%. Always a problem area for Kentucky, the smoking rate stayed relatively the same in 2015, at 26%. This puts Kentucky at the top of the list of states with high smoking rates. In KIPDA, there was a concerning increase in current smokers, rising from 20.4% in 2014 to 25.4% in 2015. Although KIPDA residents typically have slightly lower smoking rates than the state rate, this brings the KIPDA rate nearly up to the state rate. But although the current smoker rate for Kentucky remained relatively unchanged, KyBRFSS Project director Sarojini Kanotra said that there has been an encouraging downward trend in the past few years. “We are still much higher in the smoking rate as compared to other states. However, the prevalence of current smokers is showing a slow and steady downward trend since 2011,” Kanotra said. While Kentucky and KIPDA report lower rates of binge drinking (hovering around the national median on heavy drinking), there was an increase from 2014 to 2015 in binge drinking rates. The state rate slightly rose from 13% to 15%, while the rest of the nation remained about the same at 16%. KIPDA saw a larger increase, from 16% to 20%. Alternatively, the depression rate dropped from 2014 to 2015, while the national state median remained unchanged. The percentage of adults in Kentucky who have ever been diagnosed with a depressive disorder fell from nearly 24% to less than 19%. KIPDA fell from 23% to 16%. When asked about the decrease in diagnoses, Kanotra said that the question had not changed from 2014 to 2015 and she could not speculate on what caused the decrease. The BRFSS is a collaborative project of the Centers for Disease Control and Prevention (CDC) and the Kentucky Department for Public Health (KDPH). Currently, all 50 states and the District of Columbia participate in the project. The BRFSS aims to collect uniform, state-specific data on preventive health practices and risk behaviors that are linked to chronic diseases, injuries, and preventable infectious diseases that affect the adult population.